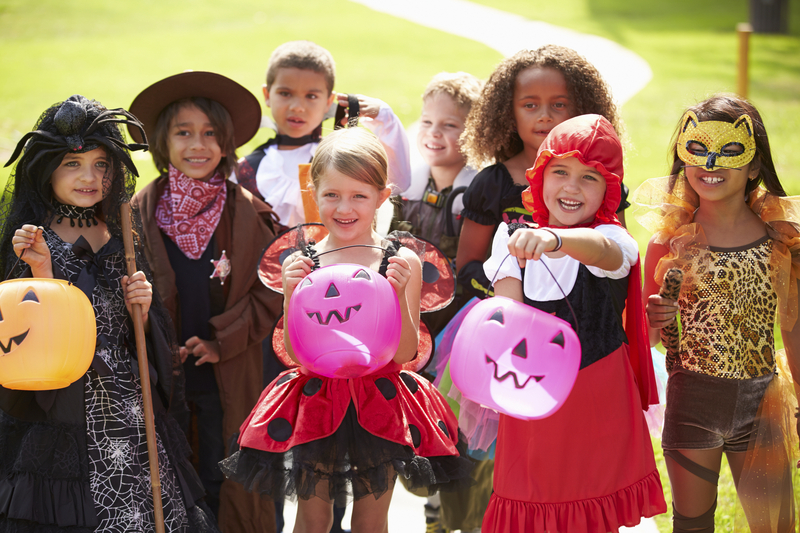 For children with an inborn error of metabolism, Halloween celebrations can be tough since protein-containing candy and snacks tend to be the classic party staples. 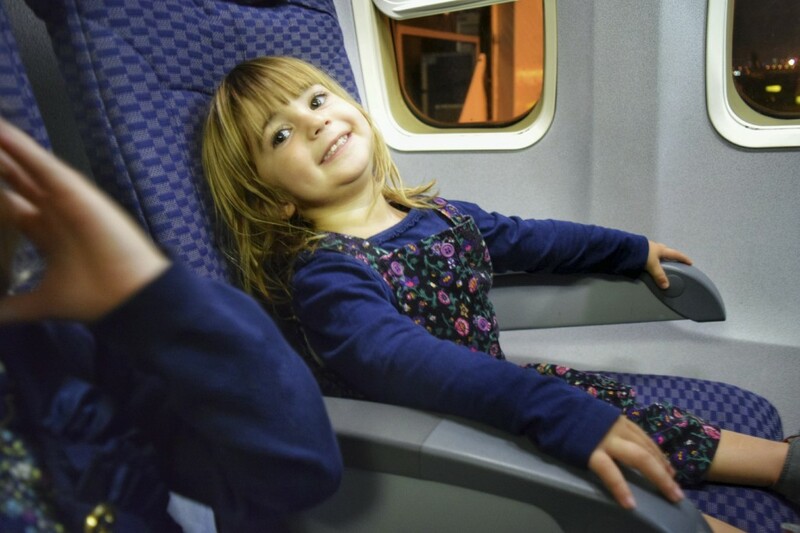 Additionally, these celebrations can be scary on parents as they want their children to fully enjoy in the festivities while maintaining their dietary restrictions. Get creative with Halloween Have non-food treats to hand out at home or at school. Think dollar store toys, stickers, party favors, and coloring books. Consider having a “swap-party” where your child can swap candies he/she cannot have for “allowed” This way everyone gets what they want! 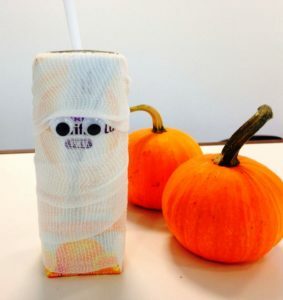 Post Your Formula ‘Dressed-Up’ for Halloween and TAG Nutricia! 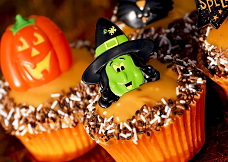 Surprise a special someone or treat yourself to a Halloween cupcake. These cupcakes are made with Loprofin Baking Mix. They are easy to make and great for at home, work or parties. Note: Any additional frosting or decorations may add additional protein, phenylalanine, leucine or calories, be sure to read labels and account for any topping or decorations. All Nutricia products shown are for the dietary management of inborn errors of metabolism and must be used under medical supervision. Please consult your metabolic healthcare professionals prior to making any changes to your diet. 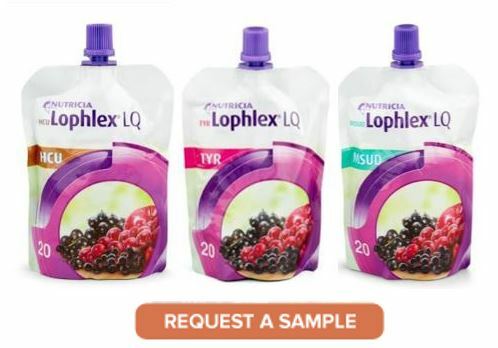 PhenylAde GMP Drink Mix is available in a great tasting neutral flavor (Original) or a mild vanilla flavor (Vanilla), but for people who like to get creative this formula can be turned into additional flavors. Try one – Try them all! Simply mix serving (33.3 g) with 5 – 6 fl oz (150 mL – 180 mL) and then customize to your favorite flavor. 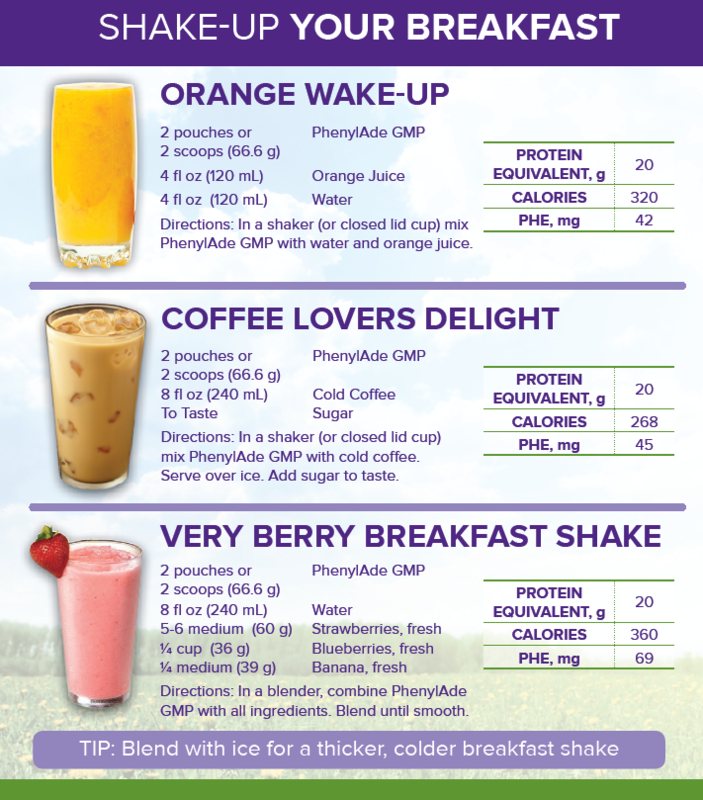 Here are some additional great tasting recipes featuring PhenylAde GMP Drink Mix. Some people may use this product as their main PKU formula or just as part of their PKU diet plan. 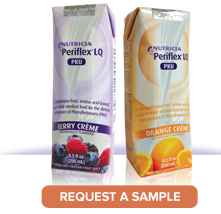 Talk to your metabolic healthcare professional to see if PhenylAde GMP Drink Mix is right for you or your child. NOTE: *Always consult your metabolic dietitian or physcian prior to making any changes to your PKU diet plan and to see if PhenylAde GMP is right for you. Satisfaction from food or a meal is something everyone wants. Although many foods may be restricted or limited on a low protein diet, you do not have to compromise taste. Selecting the foods you eat involves a variety of factors. We choose foods based on taste and smell, in addition to texture, sight and culture. To make the most of your meal, begin by identifying what you crave, like spicy, sweet, crunchy or salty. This will make your meal more satisfying.Here are some tips to help you make the most of your meal. Spicy: Add seasonings that can add a kick. For example, add cracked pepper, crushed red pepper or hot sauce to steamed vegetables to give a familiar item a new twist. Sweet & Tangy: Satisfy your sweet and tangy craving with grilled pineapple topped with BBQ sauce on a low protein bun. You can also add mandarin oranges and Italian dressing to a garden salad for added flavor and tang. Crunchy: With a little creativity you can add a snap to any dish. Make your own salad croutons with low protein bread. Season them in a variety of ways by using garlic powder, cayenne pepper or Italian herbs depending on your personal desire for savory or spice. Another great way to add crunch is to include raw vegetables, like cucumbers or carrots slices to a salad or sandwich. Salty: Salt is among the most popular taste craving. Although highly desired, salt is an ingredient to be used in moderation. A little bit goes a long way. To satisfy your craving for salt, try slicing fresh potatoes very thin and sprinkling with garlic and a touch of sea salt. Bake them until crisp for a satisfying addition to your meal or snack. Smooth and Creamy: Create your own creamy low protein dip with your favorite seasonings for a flavorful way to enjoy Low Protein Crackers or fresh cut vegetables. You can also include a sweet treat at the end of your meal to help satisfy your need for something smooth and creamy. You are busy, so don’t let your PKU formula slow you down. 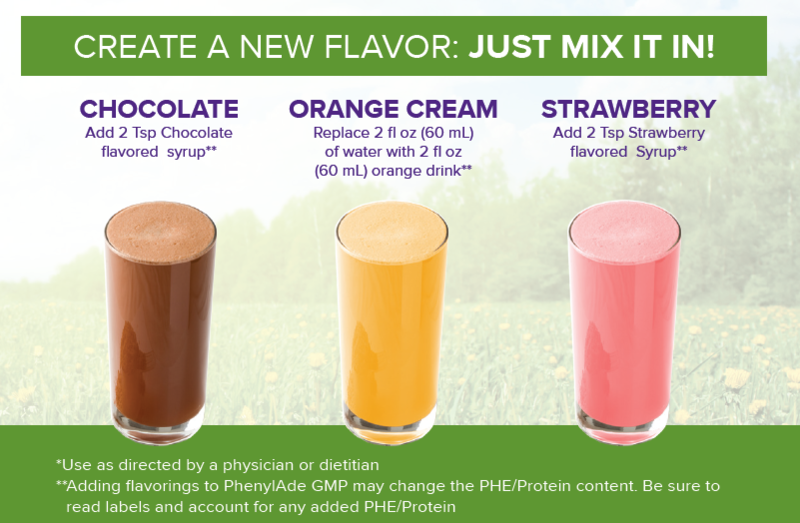 Grab a store bought (protein-free) drink and add PhenylAde 60 to create a custom PKU formula you can enjoy anywhere, anytime! 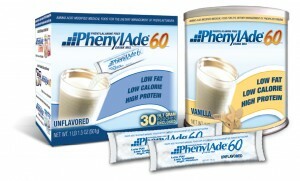 Check out these great, 1-step recipes featuring PhenylAde 60. 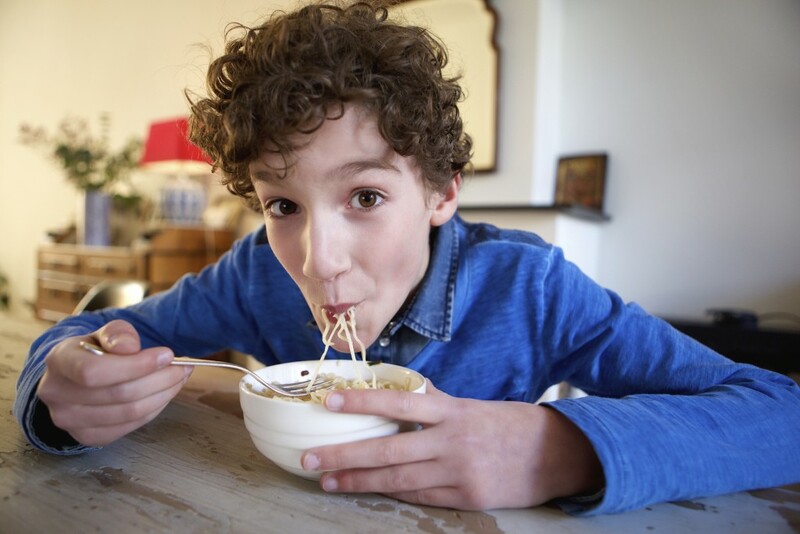 Does your child love low protein pasta? My child would eat pasta every day, every meal if I let him. It is great he found a food he enjoys, but I want my son to eat more vegetables and other healthy foods that provide fiber and other nutrients. Here are some ideas to feed your child’s low protein pasta cravings, but to make your low protein pasta last longer and provide more dietary variety. Dicing carrots and celery (the smaller the better for young kids) and simmering in a vegetable broth with low protein pasta added is a low pro and filling lunch or dinner. You can use Loprofin Animal Pasta, Rice, or broken Spaghetti to keep it new and exciting. Fresh dill adds a great ‘soup’ flavor and expand your child’s taste palate. Bulk up your Low Protein Spaghetti by mixing with Zucchini or Yellow Squash noodles. With a spiral vegetable slicer this only takes minutes and can really satisfy a bigger appetite. You can do so many different meals with fresh or frozen cauliflower and carrots, which are both naturally quite low in protein. Often, people on a low protein diet enjoy spice. Check out this recipe for Indian Curry with Loprofin Rice. I often serve my son a small amount of pasta, which he gobbles up. Then ask him to eat 3-4 bites of the vegetables on his plate. Once done I serve another small portion of pasta and repeat. All children are motivated differently, but that love of pasta usually is an incentive to eat more veggies at meal time. Kids love to eat with their hands (or at least my son does). Use Loprofin Lasagna to make a salad roll-up or other roll-up filled with veggies. Try filling a pasta roll-up with a blend of mashed potato and mashed cauliflower for a yummy kid friendly dinner entree. Although it can be easier to prepare low protein meals at home, this can restrict your work and social activities. Fortunately, many eating places are beginning to realize that an increasing number of people follow “special diets”. Many of the larger restaurant chains state that they will try and cater for customers on a special diet whenever possible. To get further information from a particular company contact their Customer Service helpline or check their website. Small cafes that make things up from scratch can prove useful (especially if they get to know you!). Ask if nutritional information is available to find out ingredients /protein content of items. Some larger, well known fast food chains, provide nutritional content leaflets for customers in the shop or online access nutrition information. – Most veggie burgers are NOT suitable, as they are high in protein. Some cafeterias can be quite flexible so it is worth asking if they can cook or re-heat some of your low protein foods. If the cafeteria food choices are limited it may be easier to take a packed lunch in. Note: Each condition may vary in tolerance for specific foods that contain protein, even if low in protein. Always speak with your metabolic dietitian or healthcare provider before adding new foods or changing your metabolic diet in any way.